Ever since it hit the market in the early 1960s, Avon's Skin So Soft bath oil has maintained a reputation for repelling ticks, fleas and other insects without the use of harsh chemicals. In recent years, Avon added effective bug-repelling ingredients to a special line of Skin So Soft products, providing extra protection against fleas and ticks. These dog-safe products are easily added to your dog's bathwater or can be sprayed onto his coat. 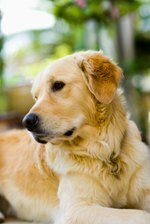 Keep ticks and fleas at bay using Skin-So-Soft. The Bug Guard line of Skin So Soft by Avon comes in aerosol and pump sprays for easy use on both humans and pets. To use the original bath oil, Field and Stream magazine recommends mixing 1.5 ounces with a gallon of water and spraying it onto your dog just before heading out. A flea and tick shampoo is made using 1 cup of Skin So Soft and 1/2 cup liquid detergent in 3 gallons of water.